How are your customers finding your website? Search engine optimization (SEO) means something slightly different to everyone. To us, it means making sure your website and online content are optimized to be found easily in search. As professionals in digital marketing, we have watched the shift away from the old SEO coding tactics towards authentic content optimization. Our team remains on the cutting edge of constantly changing SEO trends to be sure we understand how to get results for our clients. At the core of your optimization strategy, we conduct keyword research and perform on-site optimization, so that Google knows when to show your website in search results. We also ensure that any content produced (including blog posts, videos and social media posts) is optimized for search and designed to reinforce the link between your company and your target keywords. Are you ready to come up in more search results, make sure the right people are finding you online, and generate the results you’ve been looking for? We’re waiting to hear from you. Next Level Wellness Center, a chiropractic practice, wanted to attract more pregnant women who were looking for prenatal chiropractic care. 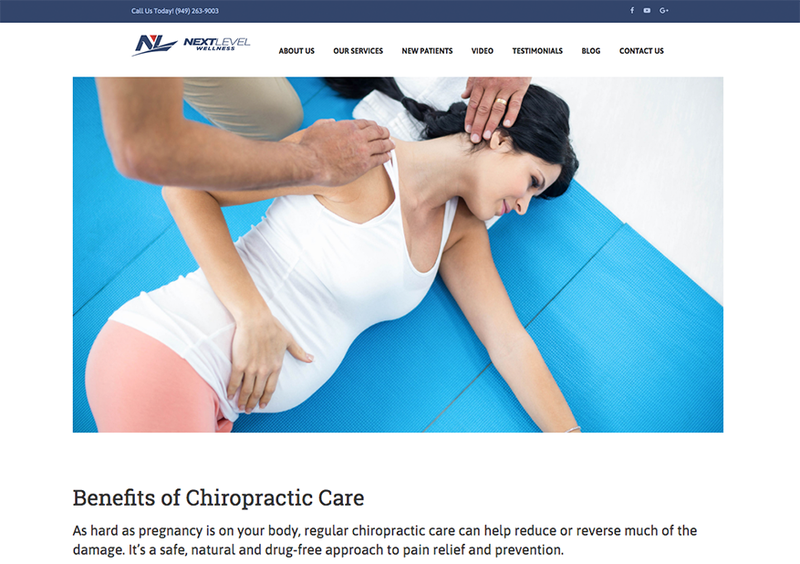 After conducting keyword research to determine the most commonly used pregnancy-related search terms, we optimized the site for those terms, and created a landing page about prenatal chiropractic care. We also began blogging weekly, using the same keywords. In less than 30 days, the website ranked on the first page of Google for pregnancy care and they started receiving prenatal inquires.